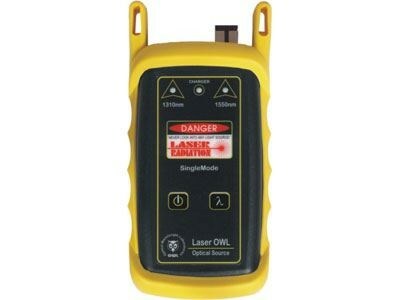 The Laser OWL 1550 is a cost effective, compact, handheld laser light source. The temperature compensated outputs are calibrated to couple -10dBm of optical power into a single mode fiber. The light source is offered with a single 1550nm laser installed, and can be easily upgraded to include a 1310nm source. The source is simple to operate with an intuitive 2-button interface: one button controlling power and the other for selecting output wavelength. LED indicators highlight the selected source and verify that battery power is sufficient to maintain the calibrated output power. Manufacturer Optical Wavelength Laboratories, Inc.